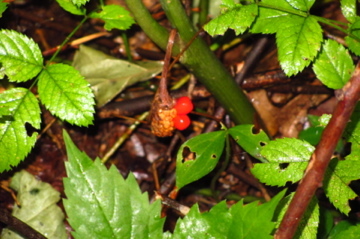 Jack-in-the-Pulpit is often confused with poison ivy, because its leaves grow in groups of 3. 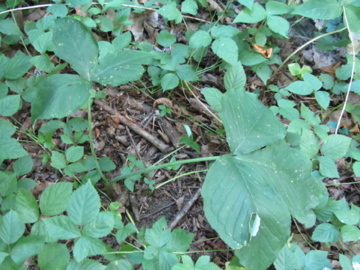 But unlike poison ivy, it isn't a vine and it doesn't grow up the sides of trees. 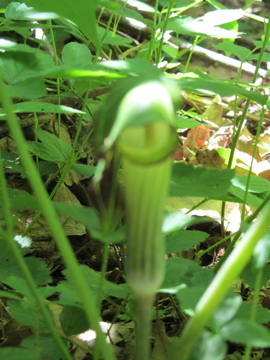 If you are out walking this trail in late April to early June, you may be lucky enough to see Jack-in-the-Pulpit in bloom. Look carefully in the center, where the leaf stems start. A yellow-green flower grows out of the middle of the plant. Part of the flower grows up and flops over, giving the plant its "pulpit" name, because it resembles a pulpit in a church. Please do not touch it; the flower is delicate. 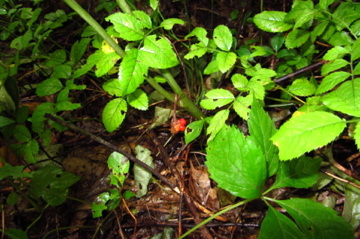 Later in the summer, the plant may have a cluster of green berries, which ripen to a bright red in late summer. 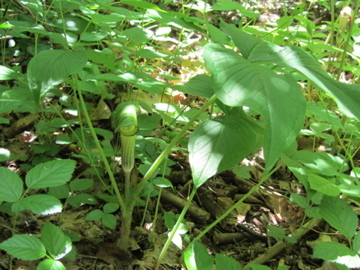 Jack-in-the-Pulpit is a wetland indicator plant, because it only grows in damp soil.